The recent reveal and surprise launch of the Epic Games store has been a major development to close out 2018, and given the potential it has to challenge the status quo, it has been a subject of much debate. I'm not typically very active in discussions like these -- I think I wrote my last blog about 10 years ago -- but as the head of a studio that's made the decision to put its next major title out on Epic's new platform as a PC-exclusive, I feel like our perspective might be relevant tо the community. As a developer that invests heavily in its titles, we don't make decisions about which platforms -- PC, console or otherwise -- to invest in lightly. Over nearly two decades, Saber has grown from a team of three people to over 450 workers across three offices, but we are still "indie" -- a privately held company with a "games first" mentality. As a larger studio, we have worked with a host of partners both big and small and our decision to work with Epic is grounded in our unique experience as a large developer. From our perspective the Epic Games store is offering us -- all of us -- an opportunity to ultimately make better games. Epic is the first company tо have a real chance to break what has amounted to a virtual pricing monopoly by the major digital game distribution platforms. While Steam provides a whole host of services and features that have been built over the years and upon which many developers have relied, the reality is that for many developers these features are unnecessary. Many game makers already provide much of that functionality on their own; in other scenarios, players either don't need those features or have broadly opted to provide them on their own using third-party services. "Paying for features we don't need and that our end users don't want ultimately means compromises on development"
To use World War Z as an example, Saber is providing our own matchmaking in lieu of the platform holder's services. Nor do we need Steam workshop support. Obviously a strong feature set is important for a platform in the broadest sense, but for companies like mine, paying for features we don't need and that our end users don't want ultimately means compromises on development and unnecessary costs passed onto consumers. As developers, we've become accustomed to every major platform charging a 30% distribution fee for digital. It's a factor of doing business that we need to build into our models when we develop. And it's frankly an inordinate amount of money to demand, regardless of the services involved. I understand that some developers of course do need and/or enjoy these features, and for them the new Epic platform might not yet be a viable option. But as Bulkhead Interactive's Joe Brammer noted, more money in the pocket of a developer generally goes to one thing: making more and better games for players, and so the best deal for us is often the best deal for our audiences. 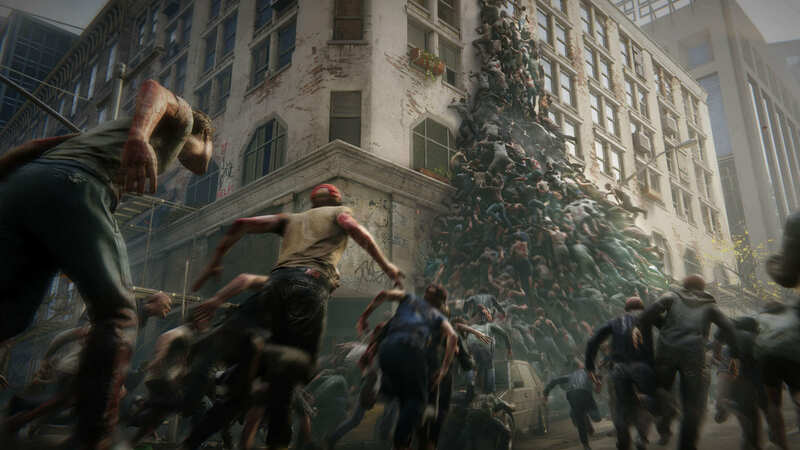 Saber hopes World War Z will do better when it doesn't have to fight hordes of competitors for visibility on Steam. Let's get this out of the way: the current feature set of the Epic Games store at launch can't compare to what many other platforms have to offer. David Galindo has laid out exactly what it's missing compared to Steam (and other PC competitors), and even those of us more optimistic about Epic can acknowledge that. So, what does Epic offer right now to justify even a 12% fee? First and foremost: visibility (which, even on its own, is arguably sufficient). Epic has built up an absolutely gargantuan audience thanks to Fortnite, and I'd venture they've broadened the market for non-casual games among casual gamers in ways we can't yet fathom. Beyond possibly Minecraft, I can't think of a game that has brought more mainstream gamers into the same sphere as AAA games. Now whether or not that Fortnite audience comes to play our titles or those of companies like us is another question -- none of us can predict yet what that demographic will do -- but it's a meaningful opportunity and the prospect of active support from Epic goes a long way to help curb the risk. "I feel confident that the value the Epic Games store is offering even in its current state is greater than what I would pay for a licensed property to help establish visibility for my titles"
It's been noted for years, even by Valve itself, that the state of product visibility and discovery on Steam leaves a lot to be desired, and this often comes at the cost of developers. While Steam has my utmost respect for what it's achieved in terms of influence and functionality, the sentiment among indies seems to be a growing fear their games will be lost in a rapidly expanding ocean of both legitimate and junk/spam titles. For a competitor to come onto the scene and offer -- for a much smaller fee -- a curated experience complemented by PR support that helps ensure visibility among players and influencers is huge, even if it doesn't add up to as impressive a list of features available at launch. And even as I expect some consumers may very well choose not to buy our products simply because they're outside of the Steam ecosystem, I am willing to take that risk for greater exposure and a chance to be part of something that ultimately will change the industry and benefit us all. As a developer who has licensed numerous properties, often paying far more than the 12% Epic is charging, I feel confident that the value the Epic Games store is offering even in its current state is greater than what I would pay for a licensed property to help establish visibility for my titles. We've already seen the impact Epic entering the distribution platform game has had beyond its borders. Changes to Steam and the Discord store are a start, and I expect that progress will continue in its downward trend, especially as the Epic Games store ramps up its feature set (which I expect it will likely do without adding to its royalty rate). The end result is this: a legitimate prospect and alternative for developers to get their games to players at a reasonable cost. And while the Epic Games store has some exclusive titles, there's nothing to prevent a developer who doesn't want an exclusive from distributing its game in multiple places to maximize its reach. Steam, the Nintendo eShop, the PlayStation Store and Xbox Games Store all started out with much more humble implementations than they have currently; few would argue they have been bad developments for the industry. When we started in the industry almost two decades ago, there were certain companies we looked up to as innovators and examples for us to follow. Valve, Epic, Id, Bungie... We've had the good fortune of working with all of them in one capacity or another now, and I know from my own experience that, beyond its core titles, what has helped Epic survive and thrive is its support of innovative gaming technologies and willingness to be disruptive. And the Epic Games store squares with all of that. Given the success of Fortnite, Epic could simply rest on its laurels. But the aim is something more revolutionary: a healthy, much-needed injection of legitimate competition on the side of distribution platforms, with an entrant who can finally match the influence of Steam and bring down costs for developers across the board over time. In the short term, that means higher profits for those making games, but in the long run, it means more resources free to go back into development and innovation, a benefit for workers and players alike. Matt Karch is the co-founder and CEO of Saber Interactive, a developer and publisher whose credits include Quake Champions, Halo: Combat Evolved Anniversary, Halo: The Master Chief Collection, NBA Playgrounds and its sequel, and the upcoming World War Z. Fantastic article. Looking forward to WWZ.